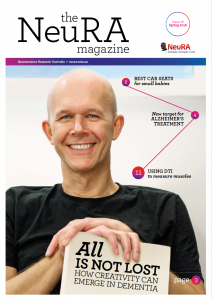 The new issue of the NeuRA Magazine (#18) will arrive in people’s letterboxes this week, but if you haven’t yet signed up for it, or would prefer to read the digital version, you can go here. The issue explores in further detail the new study from Assoc Prof Olivier Piguet’s group, which has confirmed what many anecdotal stories had previously reported; that positive skills can emerge after dementia has been diagnosed. We also speak with Dr Scott Kim, whose recent research has identified a new therapeutic target for Alzheimer’s disease. He talks about the ABCA7 gene, which protects the brain from the harmful build-up of amyloid-beta, one of the causative proteins implicated in Alzheimer’s disease. Deputy Director Prof Simon Gandevia recently wrote an opinion piece about some of the bad science that is being published in the wider community. In this issue he expands on these thoughts and how this might be corrected. We also see the results of a study by Prof Rob Herbert that revealed how images produced using diffusion tensor imaging produces more detailed and reliable images of muscles than ultrasound.